Ideum was fortunate to work with an exciting group of partners, topics, and technologies in 2017, and the result was a broad range of innovative projects and products. Our 2017 clients included a number of influential museums and popular public spaces. One of the most dynamic projects involved everybody’s favorite prehistoric creatures: dinosaurs. We worked closely with the Fort Worth Museum of Science and History to create DinoStomp, a massive interactive video wall. Equipped with Kinect motion sensors to capture visitor movements, DinoStomp brings visitors face-to-face with detailed renditions of various dino species. We also designed and developed DinoLand, which lets visitors create their own creatures and scan them into a wall-size animated projection system. Both exhibits employ the latest in large-scale display technology to immerse visitors in the ancient world. Our extensive multi-year collaboration with with the Bureau of Reclamation led to a suite of interactive exhibits for visitor spaces at Hoover Dam, spanning the Colorado River at the border of Arizona and Nevada. These experiences highlight a rich spectrum of content, from the history of the Dam’s construction and the people who keep it running to the impact of the Dam on wildlife and the ecosystems of the surrounding area. 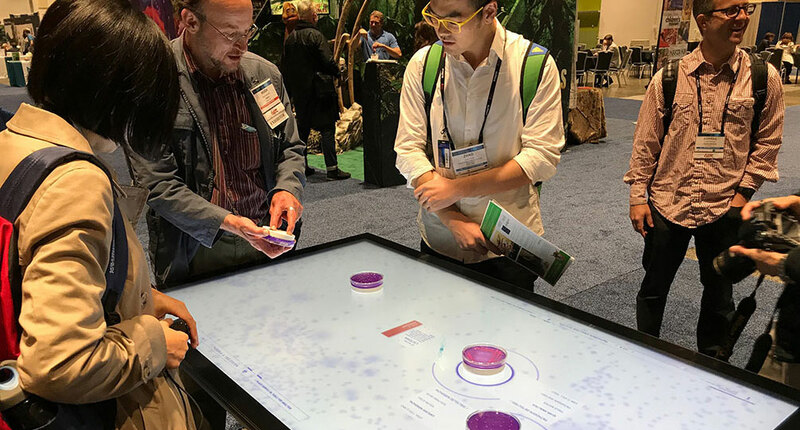 The exhibits run on Ideum touch tables and touch walls ranging in size from 55” to 86”, and several are equipped with the latest version of our gesture-driven audio accessibility layer which allows eyes-free exploration of exhibit content. At the Anderson-Abruzzo International Balloon Museum in Albuquerque, two Ideum exhibits form a core part of the new Weather Lab exhibition. The Cloud Atlas lets visitors learn about the varieties of clouds and the way they develop. At the Albuquerque Box exhibit, visitors pilot virtual balloons through New Mexico skies to learn about the weather patterns that make Albuquerque the hot-air ballooning capital of the world. In 2017, the Smithsonian Institution’s National Portrait Gallery in Washington, D.C. reopened its America’s Presidents exhibition after two years of extensive refurbishments. We were proud to create three custom kiosks that provide visitors new options for learning more about the Gallery’s unique collection of presidential portraits, the artists who created them, and hundreds of related items not presently on view. We worked with California’s Planes of Fame Air Museum to build a custom interactive experience for their annual fundraising event. 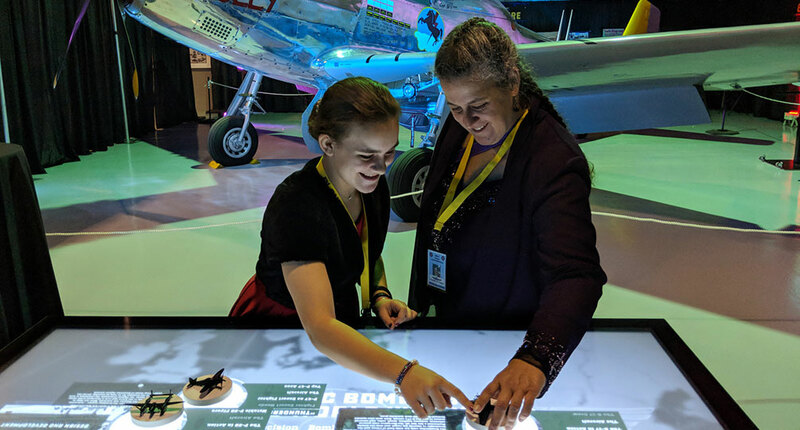 For this exhibit, we wanted to harness the power of an object-recognition user interface to tell the story of the aircraft and pilots involved in the United States’ strategic bombing effort during World War II. At the event, attendees placed tangible objects bearing models of classic warplanes on the display surface, activating onscreen information and imagery—and bringing history to life. Ideum created custom interactives with numerous corporate clients in 2017. Mizrahi Developments is building The One, a 1000-foot Toronto tower that will become Canada’s tallest building when construction is complete. We designed and built an integrated touch screen and video wall system for their sales office that customers are already using to search for their dream homes in this gleaming skyscraper. At the other end of the continent, we worked with design firm West of West to make a retail experience with an unexpected twist. At Stashed, a San Francisco boutique, hidden LED arrays are embedded in display furniture. When customers examine the right pair of shoes, the panels activate, displaying scrolling messages from the shoes’ designers shining through the veneer. These Raspberry Pi-powered units provide a new way for the store to share the stories behind their merchandise with customers. Ideum made significant advances in our hardware and software products last year. 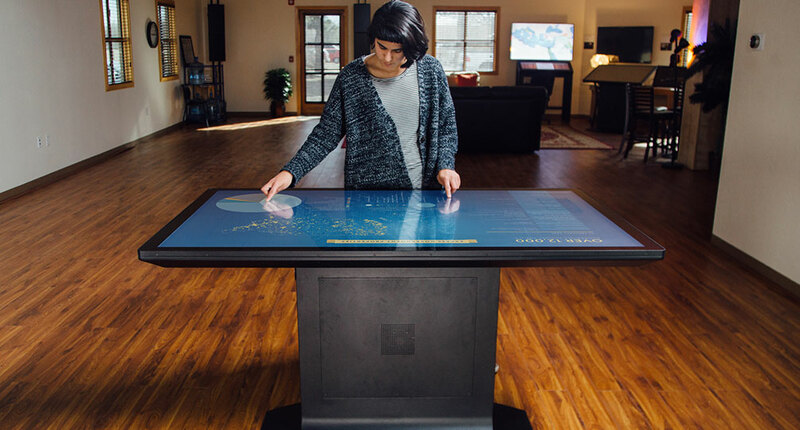 Our new 86” Colossus touch table is designed for demanding public spaces and large enough for up to 8 people to explore interactive content simultaneously. Bezel-less and crafted from aircraft-grade aluminum, it comes with an Intel Quad Core i7 system with 32GB of Ram, 2 1TB hard drives, and a dedicated NVIDIA GTX 1080 graphics card. It’s the perfect solution for group exploration of large-scale interactive maps and landscapes. We completely redesigned our Portrait kiosk, a 55” vertical display built around the latest 3M touch technology. Slimmer and sleeker than ever, the new Portrait utilizes our latest aluminum-extrusion manufacturing process for tighter tolerances and improved durability. The Portrait can be purchased with a built-in Kinect motion-sensing system for exhibits relying on tracking visitor movements. We launched an updated version of Tangible Engine, our innovative object-recognition software package. The first authoring software of its kind designed to work with projected-capacitive touch screens, the Tangible Engine SDK allows allows C++ and Unity3D developers to include support for tangible object user interfaces in their applications. In addition, we created the Tangible Engine Media Creator, a drag-and-drop package that allows anyone to design tangible object interfaces with little or no programming. Text, images, and colors can be configured around tangible objects in seconds, allowing rapid prototyping of interactions and designs before moving to full development. We’ve already created tangible object user interfaces using 3D printed conductive bases attached to beer steins, wine glasses, coffee mugs, aircraft models, medical equipment, and a host of other items. Ideum has an active research and development program designed to explore the possibilities and challenges of emerging technologies and experiment with new kinds of visitor experiences. Much of the work we do with our clients is informed by our continuing R&D work. For example, our Exploring Pueblo Pottery project provided an opportunity to extend the latest large-scale display technologies to tell the stories behind some of the nation’s oldest traditions. We worked with Acoma Pueblo artisan Michelle Lowden and UNM instructor Clarence Cruz to design an experience that allows users to investigate the intricate designs of pueblo pottery and learn how they highlight elements of Native American art, history, and culture. The experience uses a 360 degree projection mapping system to cast designs onto an oversized white olla, or water pot. Images from the system’s 4 projectors are seamlessly blended on the pot’s curved surface, bringing designs depicting clouds, rain, lightning, and local wildlife to life. Accurately rendering and integrating these images on the pot’s surface while maintaining their integrity and content required our projection mapping team to achieve new levels of precision with these techniques. We built an experimental application called Can It Kill You? to showcase the possibilities of the Tangible Engine Media Creator. At this experience, visitors place petri dishes supposedly containing microorganisms on an Ideum touch table, activating information about the specimens’ potential deadliness. The dishes sit on patterned conductive bases which are recognized by the application to bring up specific information and imagery. We built the entire experience in less than 2 weeks to illustrate how the Media Creator puts the ability to build elegant and compelling applications into the hands of any developer. Investing in experimental projects like these allows us to test new approaches that ultimately lead to greater efficiency and higher performance in later projects. These are just some of the exciting projects and partnerships we cultivated in 2017; our Portfolio details many others. They all illustrate our core goal: to be creative and collaborative as we design and build the most engaging and cutting-edge experiences possible. We were proud to push the envelope in 2017. Watch what we accomplish in 2018!